With the expansion of the Chicago Riverwalk well underway—the Sasaki Associates–led project is supposed to open its first portions over Memorial Day weekend—the river is enjoying a surge of attention once unimaginable for a body of water better known historically for its pollution than its public space. Over the next 15 months, however, the city-appointed group—the Metropolitan Planning Council and Friends of the Chicago River, as well as “topical experts and community stakeholders”—will seek ideas for all the rivers that comprise the subwatershed known as the Chicago Area Waterway System, including the Chicago Sanitary and Ship Canal, the Cal-Sag Channel, and the Calumet Rivers. The city launched a website, greatriverschicago.com, which so far just lists facts about the area’s rivers and links to a survey meant to inform their future planning process. It asks Chicagoans to describe their current interaction with the river system, and how they’d like that to change. 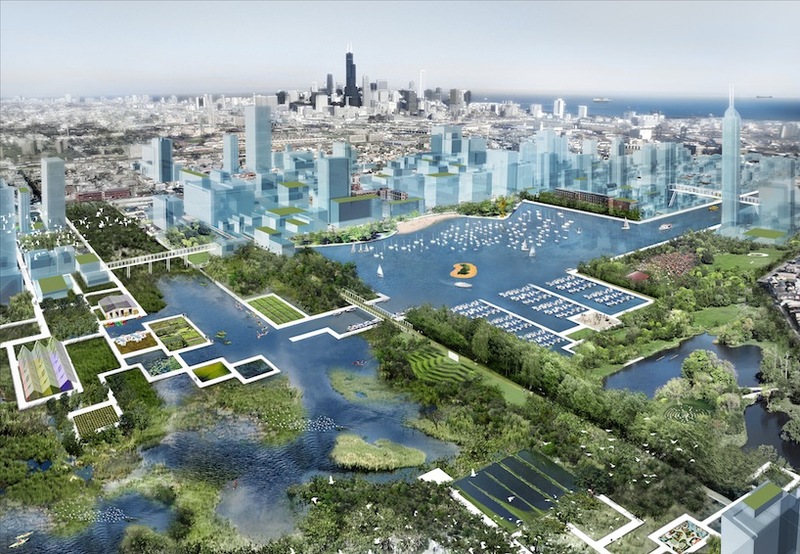 “Reclaiming the Edge” by Studio Gang presents a vision for the future of the Chicago River that includes a series of inland lagoons. October 23, 2018 What will be Rahm Emanuel’s legacy on Chicago’s architecture?